The cookie cutter is out and the personal approach is in. Competing for customers online is now harder than ever, with so many options out there for guests to choose from. Gone are the days when few businesses had a digital presence — now everyone is there marketing themselves in the online space, with those that succeed reaping the benefits and taking home the bookings. In a simple sense, personalisation is the ability to make each guest feel special and valued by approaching them with a tailored set of actions based on their specific needs. Face-to-face within your hotel, this can be done by your staff, the GM, in the restaurant etc., but how do you get personal before a guest has even stepped over the threshold? As the first port of communication with most customers, it’s now vital that personalisation should be initiated on your website. If you aren’t already doing this, then it’s likely that you are losing business, and missing out an important initial step in creating long standing guest relationships. Take a look at Netflix for example — each time you visit your account they show you tailored content and ‘suggestions for you’ based on your previous ‘watching history’. It introduces you to different shows you might like, and in turn keeps you watching with them, taking the research job away from you automatically and presenting you with the shows you want to see. While we aren’t in the movie business, it’s easy to see how successful big players like Netflix have been, and that’s largely due to their personal approach and compelling content strategies. As a hotelier there are many ways to look at personalising your website, by using a selection of tools and technology available. 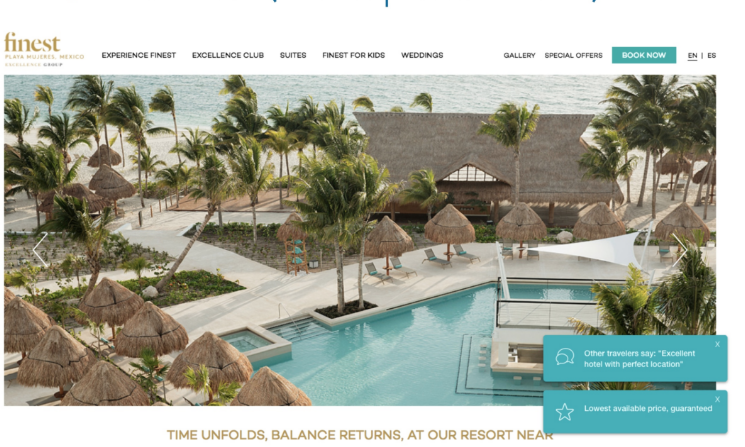 These tools will enable you to automatically show guests what they want to see, (and when they need to see it), instantly elevating the user experience. Here we talk all aspects of what personalisation could mean for your hotel website, and how it should (if it isn’t already!) be an essential part of your digital marketing strategy. 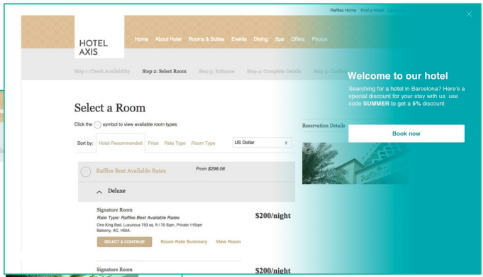 Firstly, what is personalisation in a relative sense to your hotel website? In this sense, personalisation means having the tools to tailor your website to a customer’s specific characteristics and preferences. To do this, you will need specific personalisation technology which will identify the characteristics of your customers and subsequently enable you to automatically adjust your website to each individual. Initially tools will need to include analytical features (to analyse behavioural patterns) followed by tools to implement these findings on your website in real-time. Reason for visit, USP’s and traveler type (e.g. business or leisure) are some of the most important things to find out, so that you can respond in a targeted way. For example if visitors are arriving on your site and the majority are looking to come for the ski season then you should push key messages like “10 minutes from local ski lifts” or “view our special ski or snowboard package,’ to pick up on that intent. So what tools are available and how do they work? The following tools will help you get to know your customers, start to build strong relationships, increase conversions, and ultimately use intelligence to filter into other aspects of your booking funnel / sales and marketing strategy. Aside from language options and device preferences (mobile, desktop, tablet etc.) — the most obvious forms of personalisation — the below are a sample of tools available to get you started on your personalisation journey. Add specific layers to your website to highlight special offers, incentives or as an additional communications touch point. Welcome layers are a great way to say hello to new guests (perhaps greeting them with a percentage off first time booking) or showcasing incentives with clear calls to action. These can, and should be, fully personalised to your website look and feel, and appear immediately on arrival or with a time delay. They can be fully personalised to offer guests an incentive if they have already shown intent. For example if guests are searching for dates over Christmas or Easter the layer can appear just to them. If you’re a hotel group and one of your hotels is sold out — use a message to direct guests to book at another of your properties. Add notes to your hotels website to give your guests more information. These display in the form of small pop-ups and are an extremely effective and simple way to showcase key messages, USP’s, offers and incentives. Build trust by adding a ‘book direct for lowest price guaranteed’ note, or tell guests about the advantages of your hotel through other guest reviews by saying ‘other travellers say excellent hotel with a great location’. All messages should be personalised to specific hotel offers, amenities, messages and more, and should be based off your analytical data in relation to traveller type, reason for visit etc. A favourite tool of the OTA’s, take your notes to the next level with ‘activity notes’ to create a sense of urgency and scarcity. Personalisation tools can measure your hotels activity and translate it into notes that illustrate how popular and attractive your hotel is. 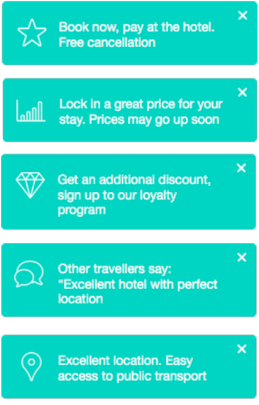 For example, ‘10 people are looking at this hotel’ or ‘there are 2 people looking at this offer right now’ — to give guests a helpful push in the right direction. These messages are updated in real time, with real data — but there’s no need to worry, as an embedded quality filter would ensure messages only show up when positive, (e.g. it doesn’t show up if the number is too small). All notes should be completely personalised, from the message displayed, to symbols, colours, page position, location (i.e. on a specific page on the website or booking engine), timings and links. Catch guests on the way out of your site with an exit strategy. This is important as it’s your last frontier (and line of communication) to keep a customer on your website and within the booking funnel. A personalised ‘Exit Intent Pop-up’ can showcase incentives, offers or key messages to try to reengage and reignite intent. Messages could include ‘book now and get 15% off your reservation’ or even ‘leaving us so soon? Why not take advantage of…” to highlight features. 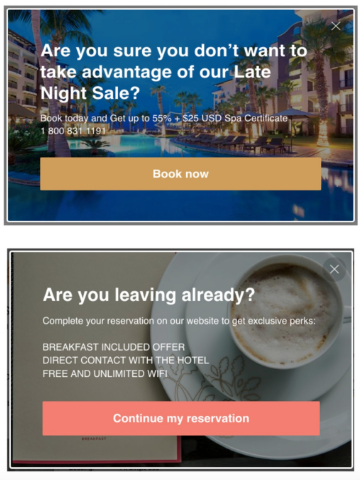 As with notes, the text, design and positioning of your exit intent pop-up can be fully customised to your liking. 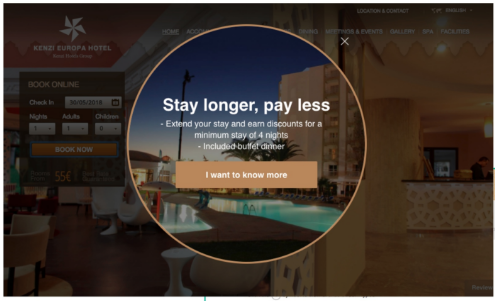 Advanced user and booking rules also allow you to personalise pop-ups based on customer segmentation. You may want to show a different exit intent to loyal customers than new visitors for example, or perhaps you only want to offer an exit intent to customers from a certain source — for example from a specific OTA, meta search or even social media platform like Instagram. You can also show different messages to visitors from specific countries too and in different languages. The above is just the tip of the iceberg in terms of tools available to bolster your booking experience. The Hotels Network offers an array of tools personalised specifically to your hotel and what areas you need to address in the conversion process. And the good news — your team needs no prior technical knowledge to implement this sort of software. The e-commerce or marketing team can simply update the website any time they want and see results immediately. 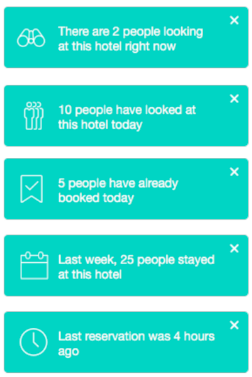 Helping hotels increase direct bookings through context and personalization.